The Lahainaluna High School Foundation is a great resource to start connecting with Lahainaluna Alumni. Many people contact us regarding planning reunions and how they can help out Lahainaluna High School, students, and the community. 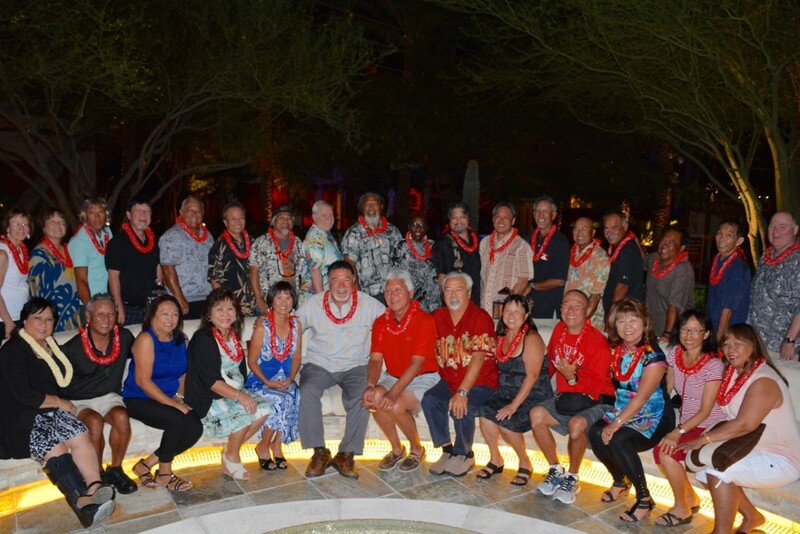 The class of 1973 recently gathered for a reunion at the Red Rock Casino Resort & Spa in Las Vegas. Pictured (from left) SEATED: Lynette Mahoe Holmes, Tony Sumibcay, Marlene Garma Burgart, Shelley DeGracia Hoyer, Joyce Sambrano Wada, Allen Ventura, Gregg Wada, Harold “Buzz” Hubert, Colette Imasaki, Dale Fujiyama, Christine Wada Wong, Lee Ann Nishimoto Shigezawa, Val Bancaco Long. STANDING: Louisa van der Linden Shelton, Judy Takatsuka Cramer, Kahiwa Reimann, Brian Takatsuka, Duane Molina, Earl Kikuyama, Artemio Panglasigui, Jeff Barnes, Randy “Hano” Blando, Marchelle Hill Phillips, Rodney Kalalau, Shayne Chung, Mel Kaaa, Bobby Peralto, Edwin “Chico” Gomes, George Bartolome, Dan Tanaka, and Paul Schuman. If you are interested in planning a class reunion or have any questions, please contact the Lahainaluna High School Foundation via e-mail or telephone. This information is available on the Contact Page.